As you leave the Airport, you are on road N19. It eventually joins road N18, connecting Galway and Limerick. Click here for new window with google maps. Off N19, take N18 to Limerick. After 1-2 miles you will see signs for Bunratty. 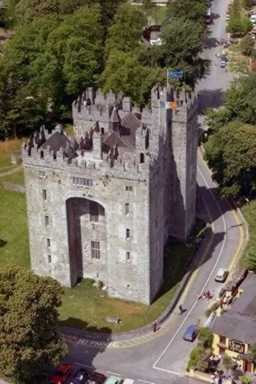 Follow N18 to Bunratty and continue to Bunratty Castle. You will be so close to the Castle that you can roll down the window and almost touch the Castle wall. Durty Nellies Pub is in front of you, on the left-hand side. See photo at right; Durty Nellies is in lower right corner. Take a left onto Low Road, between Durty Nellies and Bunratty Castle. DO NOT pass Durty Nellies Pub! Drive through the car park. In front, the road narrows into a little country road. Ashgrove House is less than a mile on the left. It’s the 7th house on the left, or the 5th B&B on the left. From Limerick, Ennis, or Galway, see steps 2-5 above. Shannon Airport is very convenient. The pace here is leisurely, and that’s a bonus – especially for our American guests who will be driving stick-shift on the wrong side of the road. You are in rural Ireland almost immediately, unlike arriving in larger Irish cities like Dublin or in Cork. Visit Shannon Airport for lots of useful information. Buses connect through Limerick and Ennis to every part of Ireland. 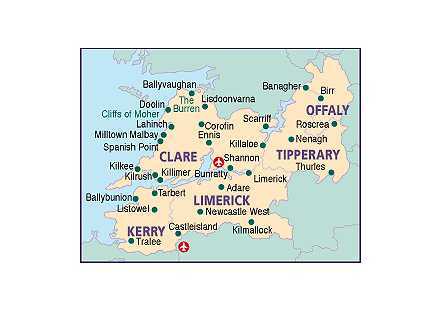 Limerick is 9 miles from Bunratty, and Ennis is 11 miles.